Angels for You: The Clean Sweep! 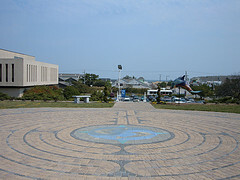 When you visit the Association for Research & Enlightenment, a beautiful dolphin labyrinth is on the hill in front of the old white hospital building, a life time dream of Edgar Cayce, known as the "Sleeping Prophet." On July 15, 1928, Archangel Michael spoke through the sleeping Cayce for the first time. It was several months before the first holistic hospital was to open. "I AM MICHAEL, LORD OF THE WAY! BEND THY HEAD, O YE CHILDREN OF MEN! GIVE HEED UNTO THE WAY AS IS SET BEFORE YOU IN THAT SERMON ON THE MOUNT, IN THAT ON YON HILL, THIS ENLIGHTENMENT MAY COME AMONG MEN...FOR IN ZION THY NAMES ARE WRITTEN, AND IN SERVICE WILL COME TRUTH." The readings tell us that "Michael is an archangel that stands before the throne of the Father...Michael is the lord or guard of the change that comes in every soul that seeks the [spiritual] way..."
Looking back, Archangel Michael, was a major influence, in helping me let go of my 20 years of government service to start a new life. When I stepped out on a spiritual path, his guidance led me to the next step, not that I realized it at the time. It wasn't until I began researching the Edgar Cayce readings that I gained a better understanding of the powerful role he plays in moving us to a higher consciousness in thought as well as spirit. 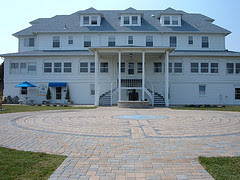 It came to me that walking the labyrinth on that "holy hill" is a powerful way to connect with Archangel Michael. He is a sign of Light in the midst of the darkness of heavy testing we're going through now, both personally and globally. His message is rather than fear the upheavals, we should spiritually prepare ourselves. The best way to do this is by awakening to our thoughts and actions, for we are freely given the choice between light and dark, life or death, love or fear. We get to experience the outcome of our thinking. If we can accept our tests as gifts bringing spiritual opportunities to take us to a higher level of consciousness, we will graduate more quickly. The closer we get to the Light, the greater the need to stay vigilant for God's Love while in the throes of change. Angel had never jumped up on this three shelf bookcase mounted on the wall. It held some of my dearest treasures. Cleaning up the mess, I was surprised how peaceful and accepting I was. One teapot, over 100 years old, was just given to me by a dear elderly friend as a remembrance of him. It had come from Japan, a treasured gift, many years ago while he was in the military. My iris Lenox teapot, a gift from Mom, now had no handle. Last night I had been thinking about having a tea party! This had all the makings of Wonderland! It seemed like a lesson in letting go, kissing our materialistic nature goodbye. Waking up! I was thankful for the humor of the music box and also for Archangel Michael helping me to hearken to a higher spiritual calling as I swept up some of my earthly treasures this morning. It was a clean sweep. The words of "Lord of the Way" are for everyone seeking to be a part of this spiritual renaissance. Diamond Backs on the Runway.